Dozens of great new books hit the shelves each week, and it’s virtually impossible to read all of them. We’ve combed through this week’s new releases and picked some books that should be on your radar. This is the first of our seven-part series of New Comic Book Day blog articles. SPOILER ALERT — We’ll try to be as spoiler free as possible, but they might creep in to our reviews. It’s Morphin’ Time! BOOM! 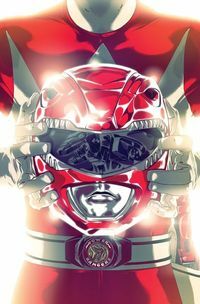 Studios just kicked off the new Mighty Morphin Power Rangers series with one hell of an issue #0. The series stars the original Rangers from the ’90s television series and picks up just after the “Green with Evil” story arc. While the tone and look of the book has been modernized a bit, the series manages to fit in plenty of the signature MMPR wit and attitude. …and then it was time! 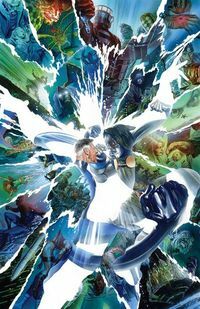 It’s finally here: the exciting end to the huge Marvel event, Secret War #9. Find out what happens when T’Challa wields the Infinity Gauntlet against the god Victor Doom in their epic battle for the fate of the world and everyone on it. See Namor’s last heroic days alongside Black Panther! Be amazed at Reed Richards’ final gambit to save the universe! Will the Molecule Man help out? Does he even want to? And does he ever get a hamburger?! You’ll have to read to find out and see what events will shape the Marvelverse as we know it today. Jonathan Hickman knocks it out of the park again with his ability to weave many intricate storylines together in order to create a wholly unique universe and pull us all along with him for the ride. While this book is based on the hit video game and tells the story leading up to the events in Plants vs. Zombies: Garden Warfare 2, it’s also great for people who are new to the franchise. I continue to be amazed at Paul Tobin’s chameleon-like ability to expertly tell stories from distinct genres. Plants vs. Zombies: Garden Warfare is full of whimsy and humor, and is a great extension of Dark Horse’s other Plants vs Zombies comics. 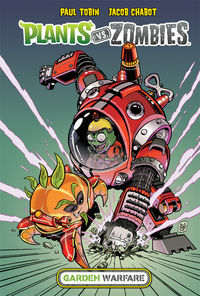 I’m a big fan of Ron Chan’s work on earlier PvZ books, and Jacob Chabot’s style in Garden Warfare really matches the earlier volumes — I’m a fan. As with previous installments, Matthew J. Rainwater delivers top-notch colors. He’s one of the best in the industry.